In this post, I will show you how to implement SiteMapPath in asp.net. The SiteMapPath control is a navigation control that allows the user to know the current page location with respect to the home page. Step-2: Add some pages to project. Go to Solution Explorer > Right Click on Project > Add > New item > Select Web Form using Master page > Enter Page name >Add. Step-3: Add a Sitemap file. Go to Solution Explorer > Right Click on Project > Add > New item > Select "Site Map" File > Enter Page name >Add. Write below text (Content as your Site Structure) to SiteMap file. Add this inside System.web file. Step-5: Add SiteMapDataSource control into site.master page. Step-6: Add Menu control in Master page. 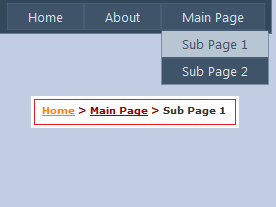 Step-7: Add SitemapPath control into Master page. Click on Menu Link and Check your SiteMap path.